Ich habe bei der European Taiko Conference in England viele (natürlich nicht nur) junge Taiko-Spieler getroffen. Viele dieser Spieler waren von den lokalen Gruppen Kagemusha Taiko, oder zugehörigen Gruppe Tano Taiko, also waren die Gastgeber der Konferenz. At the European Taiko Conference in England I met a lot of (not only) young taiko players. Many of those young players were from the local groups Kagemusha Taiko and Tano Taiko, who were the hosts of the conference. All of these young drummers, around the age of 20, were fantastic skilled drummers, but that wasn’t the part, that impressed me most. It was their sincerity, their helpfulness, their openness and curiosity. They helped out moving drums around during the conference, talked to strangers without hesitation and their confidence could be clearly seen in the expression of their faces. Young people can often be seen, sunken into the screens of their smartphones, even if they are sitting together in a café, unable to recognize the virtues of real communication opposed to digital communication. I’m sure that’s not only a phenomenon in Germany, but in many countries of the world. That doesn’t only relate to young people, but as the younger generations grew up with mobile phones and later smartphones, and never experienced a time without those devices, it’s more difficult for them to see their negative sides. The young members of Kagemusha Taiko, although they owned smartphones of course, they almost never fell into smartphone zombie mode. Instead they chatted, danced, played games and just had a wonderful time with everybody. This is just a small example, but there were also many other aspects of their behavior, that showed that these were young adults, that many parents or teachers probably would have loved to see as a result of their efforts in education. But it must not (or not only) have been school, or their parents, that were responsible for the optimistic nature of these young people, there must have been a connection to them playing and learning taiko together in a group! Through Taiko Jonathan Kirby is able to communicate values. That’s something many school teachers of religious education and similar subjects struggle to achieve when they discuss with their students in class. So what’s the difference? I can only guess. But I suppose that the determining difference is, that playing Taiko is just simple fun, opposed to debating around about values and behavior. 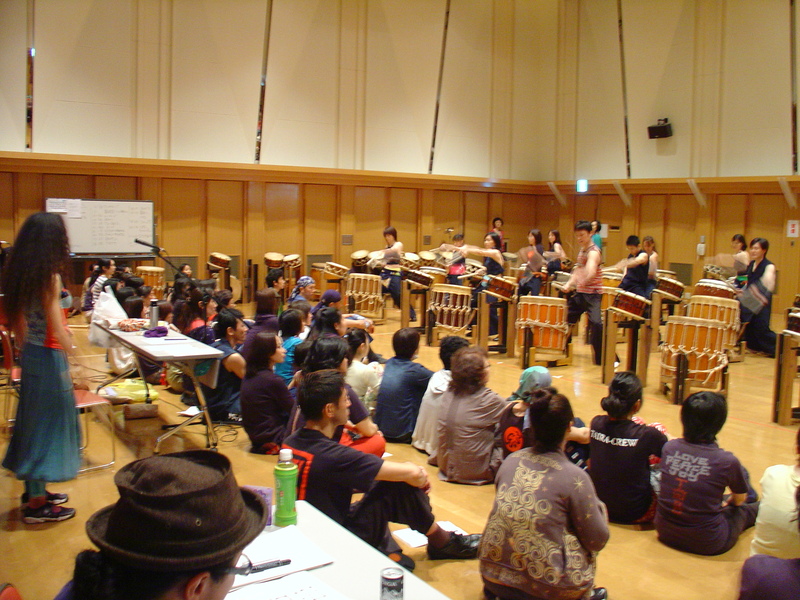 Taiko offers practical challenges that give you an opportunity to learn, and it can’t work without teamwork! Through his taiko program at schools, that Jonathan has been doing for a long while, he probably could have much more positive influence on these young people, than he could ever have through teaching French (I’m sure, he wasn’t such a bad French teacher either though!). Jonathan, you have my greatest respect for your success in not only teaching nice rhythms, but „making possible“ (rather than „teaching“) much more than that! und herausragendes Element ihres Spiels. Wer sein Instrument auf eine virtuose Weise beherrscht, der beherrscht schnelle Tempi, komplexe Rhythmen und Abläufe und erntet dafür oft Applaus und Bewunderung. Kritiker sagen dann oft, es gehe doch bei der Musik um andere Dinge und nicht darum, wie schnell und kompliziert jemand spielen könne. Das stimmt natürlich auf gewisse Weise. Andererseits gelangen auch nur die Musiker zu wirklich großer Berühmtheit, die ihre Virtuosität mit viel Musikalität und Gefühl verbinden können. Die, bei denen die Virtuosität zu einer Demonstration von Technik verkommt, die gibt es auch. Auch sie können eine gewisse Bekanntheit erlangen, aber nie auf die gleiche Art wie diejenigen, bei denen die Virtuosität nicht die Hauptrolle, sondern eine Rolle von vielen spielt.